So I was out for a couple of days and didn’t think anything of leaving my Aquafarm running like it had been for over a month now. Last night, I walk downstairs to get some water and hear a humming/buzzing noise coming from the Aquafarm. I go to see if maybe the noise suppressing insert on the pump had become dislodged again. Truthfully, I have no idea still. I came and found that the Aquafarms pump wasn’t pumping water up into the grow bed, yet it appeared to still be blowing air out of the hose, and upon my playing with it for a few minutes it seems to have started pumping water again. My current theory is that the Aquafarm’s pump slowly rattled until eventually the air hose became partially detached and thus couldn’t maintain enough pressure to keep things going. Turns out that I cannot grow lettuce in my Aquafarm. My window has quite a bit of sunlight but apparently not enough. After 1 full month, all that’s grown is some bolted lettuce that would barely constitute a single bite of food for anything larger than a rabbit. In the end I had to remove the top even though I got the water pumping again because I didn’t want all that nasty dried mold to get into my fish’s water so I took it off and left the air hose running directly into the water for him. 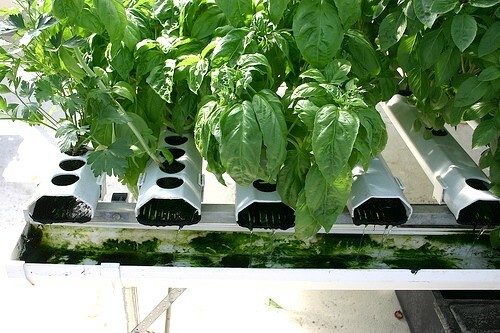 How To Avoid Aquafarm Pump Failure Next Time? For those with an Aquafarm, you know that this unit is so set-and-forget that you may forget it even exists sometimes. But like all things with moving parts, it needs to be maintained, and apparently that includes making sure the air hose is snugly connected to the pump as it has a tendency to vibrate off. Oh well, now I can get started on my next project: Growing in the Aqufarm under a T5 light.